The kind of American icon the ‘70s were experts at bringing us, Evel Knievel did one thing really well: jump his motorcycle far and high. Well, he did something else as well, and that's crash spectacularly. Famous for his huge leaps, he was likely even more well-known for his ability to recover from horrifying spills. 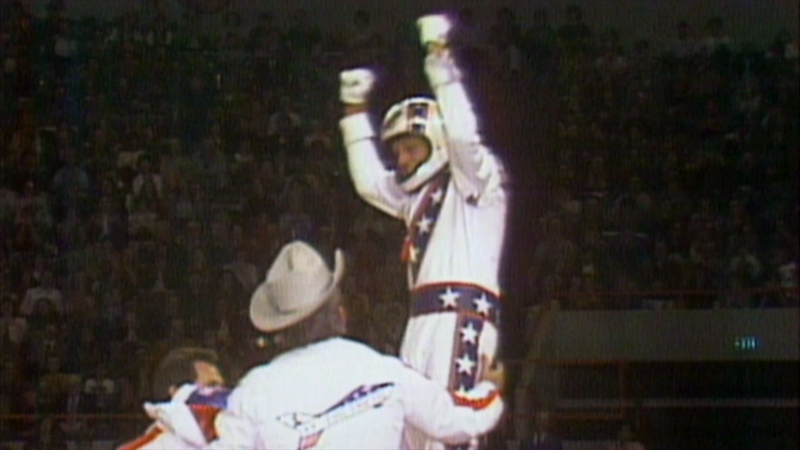 Knievel was the kind of oddball celebrity that the era feted on shows like That's Incredible and Real People. But if you only knew him from his red, white and blue caped outfit and TV appearances, you only knew half the story, as Being Evel shows by exploring his personal life and the controversies less known today. 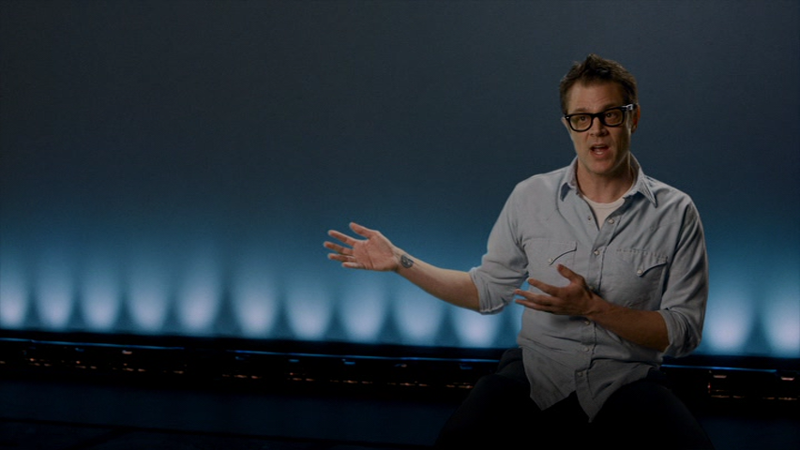 Johnny Knoxville of Jackass fame--something of a spiritual descendant of Knievel in his insane stunts--serves as a host of sorts here, discussing major points in Knievel's biography before they spin-off into interviews with the people who were there. As enjoyable as Knoxville is to listen to as he fanboys about his hero, it's in the interviews with Knievel's family, friends and contemporaries that the film really comes to life, as his personal life--from his unusual childhood in Montana to his repeated retirements--is truly a "stranger than fiction" tale. From physical assaults to battles with Hell's Angels, from infidelity to financial ruin, there's a bit of everything in this biography, and those around him are truly larger-than-life personalities, and they know how to tell an engaging story. 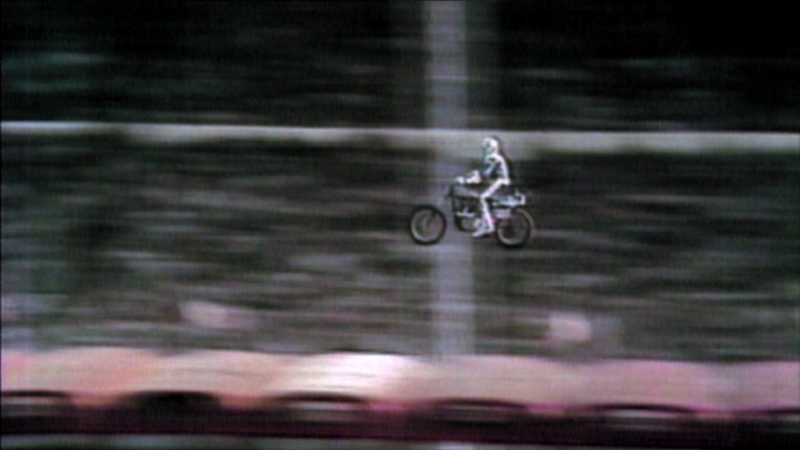 Boasting a wealth of archival footage from Knievel's biggest stunts, this film ensures there's no way that a viewer leaves without knowing his career inside and out, including his big jumps at Caesar's Palace and Snake River Canyon, as well as his love affair with the media, as he never met a microphone he'd avoid. Footage from interviews across the dial, including great clips with Johnny Carson, reveal a man who bought in on his own press clippings, which makes him quite entertaining (if also somewhat annoying.) Talking to those who followed his lead, including Knoxville, skateboarding legend Tony Hawk, BMX star Mat Hoffman and motocross standout Travis Pastrana, brings the story to the present, and makes it contemporary for those with no memory of the man himself. Director Daniel Junge (A LEGO Brickumentary) also provides plenty of context from the era, to help explain why America embraced a man riding a motorcycle the way they did. Super stylish and backed by a great era-appropriate soundtrack, Being Evel is consistently entertaining, and manages to be a balanced view of an incredibly flawed man, despite being populated by people who, by and large, are fans or were friends of Knievel (though there are certainly quite a few people, like George Hamilton, who weren't quite as tight with him--resulting in some of the best stories shared.) The bad stuff isn't glossed over in any way, which serves to make the film all the more interesting, as the extreme highs are matched with equal lows, so if you liked Knievel, you can enjoy him being celebrated, or, if you're less enthralled with him, you can see him reap the aftermath of a life lived on the edge. Either way, there's no arguing that his was a life was a story worth hearing and that this film does a good job of telling it. 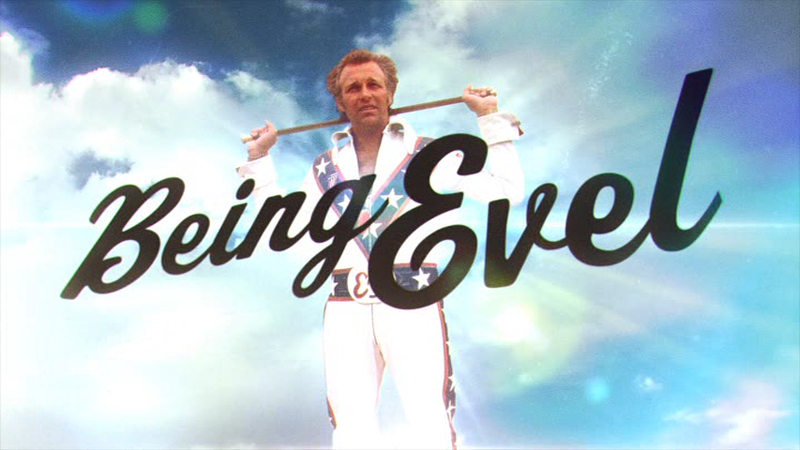 The standard edition of Being Evel arrives on one DVD, packed in a standard keepcase. The disc sports an animated, anamorphic widescreen menu with options to play the film, select scenes and adjust the setup. There are no audio options, but English SDH subtitles are available. The cinematography in Being Evel is high-end documentary gold, and the anamorphic widescreen image here does right by it, with appropriate color and saturation, a clean, sharp image and good black levels, as new interviews boast good fine detail. There's a ton of archival footage, which runs the gamut from good ‘70s video to grainy home-video, but it all fits the mood and looks as good as good as likely possible. There are no notable concerns about digital distractions. The Dolby Digital 2.0 track is fine for your standard documentary, but when songs like Donovan's "Season of the Witch" and T-rex' "20th Century Boy" come blaring out from this movie, you'd really want to feel the power of all your speakers. Other than that quibble, the sound here is clear and crisp, with all the talking heads easily understood and the mix giving proper priority to the elements. But man, watching the opening titles in surround would have been sweet. As is usually the case with Filmrise's "standard edition" DVDs, there's nothing extra here to enjoy. If you want extra interviews, seek out the Blu-ray. As a youngster, it was easy to fall under the sway of Evel Knievel: he dressed like a superhero and laughed in the face of danger. But as they say, you should never meet your heroes, as the story beyond the spotlights reveals a man you wouldn't want to know, much less meet. However, anchored by Knoxville, his story is entertaining like a crash he might have been involved in--you can't look away. The DVD looks and sounds solid, but there are no extras. Only diehard fans will want to give this repeated viewings, so a rental should hold most, but definitely give it a look.